Research is an important characteristic of the History Portfolio curriculum. As the students work toward completing a Portfolio, they will incrementally pick up research skills, and begin to work more independently. Initially though, you will need to facilitate and model the process of research. But, with some graceful steps, you can pull back a bit and let the students take the lead. When it is time to begin study for the day, show pictures from one source, maps from another, and read aloud from still another source. As you read aloud and reference various sources, be sure to make students aware that you had searched, and found some useful books with information on today's topic. After reading aloud, draw them in by reminding them that this story was only one author's view on the topic. And then, introduce the concept that it's now time to dig up some more information, and find out what other authors and publishers have to say. This will model research for the students. But, we they need to get the kids into the action. The following is a way, which I have used many times, to get kids fully involved in the process of research. I've done this in co-op with groups of various different sizes. A. Hand-select a collection of books which contain varying degrees of information covering the topic you are studying today. 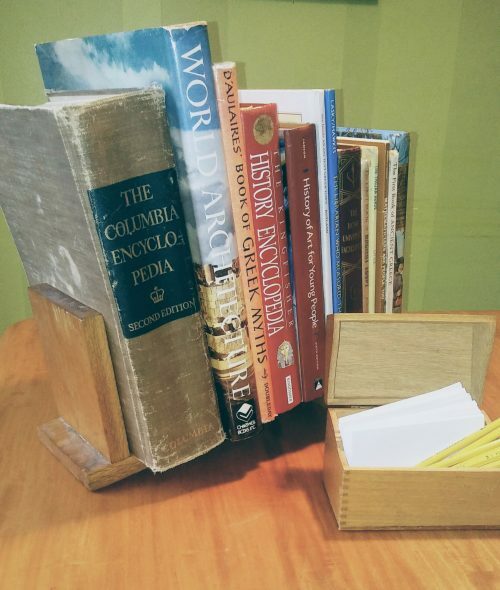 Place the books on a book stand on the "research" table. Use your public library and include: picture books, short colorful encyclopedia type books, an appropriate volume from a full set of encyclopedias, text books, etc. Have plenty of books, so that everyone can be reading from a book at the same time. I'd suggest if you have 10 students, set out 15 books. B. Read aloud from a single source, on the topic of the day. C. As a group, review what you just read by collecting key words and sorting them into topics. E. Pass out 3" x 5" cards. Instruct the students to write down on-topic information discovered during their research, one fact per card. F. After a sufficient amount of time, come together as a group and work collaboratively. 1) For this, spread the cards out on the floor and sort them into topics. 2) State the topic for each group. 3) Next, order the details within each topic. Play around with these detail cards by composing sample sentences. 4) And, finally, rearrange the topics to order in terms of chronology or importance. G. Optional: have the older children compose a report using the topics and details established in the group activity.